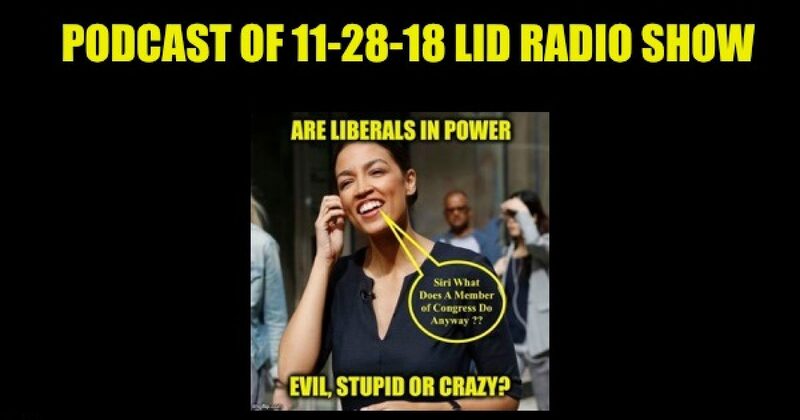 Today’s Lid Radio Show Podcast: Are Liberals Stupid, Crazy, Or Evil? Covering all the news of the day with snark. Today’s Lid Radio show was a fun rant with the goal to prove again that Democratic Party stupidity is not illegal, but it’s so much fun to point it out. Just click the player below and enjoy. Please note for some reason the show didn’t record from the 4:20 mark to the 6:05 mark please advance the player. Listen to “Lid Radio Show Podcasts Are Liberals NUTS?” on Spreaker. Covering all the news of the day with snark. Today’s Lid Radio show was a fun rant proving once again that Democratic Party stupidity is not illegal, but it’s so much fun to point it out.